Failure is a big industry these days. Every week or two, we hear reports of some high tech executive saying he wants to hire people that have tried something and failed. Failure has attained institutional stature. Failure comes in assorted flavours. You can conduct an experiment that either fizzles or blows up your house. You have failed in both cases and you may have learned the same lesson with either outcome. Still, it may take you much longer to be ready to try again in the second instance. Suppose that, in addition to a healthy crop of failures on your resume, you have enthusiasm, self-knowledge, persistence and determination. Even suppose you have talent, genius and education to boot. None of those qualities or achievements guarantees success, although they may shorten the odds in your favour. Timing and chance play a large role in failure, as well. These are beyond your control. It’s enough to deter the hardiest specimen from attempting to transform failure into success. One element that is under your control, as authors of self-help books like to remind us, is that you can define for yourself what constitutes success. If you can’t find a job that pays you a decent wage, well, redefine yourself as successful because you are living an ascetic existence, free from the strains of the material lifestyle. Problem solved! Well, hold on just a minute on that one. A recent book entitled, “The Wellness Syndrome,” takes dead aim at those who spout the view that life challenges are all within our own control. You can’t ignore the fact, say the authors, that a failure to obtain suitable employment may be just as much or more the result of economic policy than a failure of personal karma. Talent and luck might lead to early success. Maybe we should take some comfort in the fact that there are those who say that success, too soon, can be toxic. Good judgment and maturity come from the rough and tumble experiences of starting at the bottom and working your way up, they say. Success too early in life leads to aimlessness in mid-life. The early success of those who are both gifted and lucky, Time magazine uses Taylor Swift as its example, can lead to an unhealthy expectation among the rest of us that success is the norm and a crushing defeatism when one can’t measure up to the standard. Just think, but for fortune, I could have been another Justin Bieber. I could be egging houses in Malibu, urinating in trashcans and generally putting my adolescence on display for the world to see. No sir, that’s not for me. 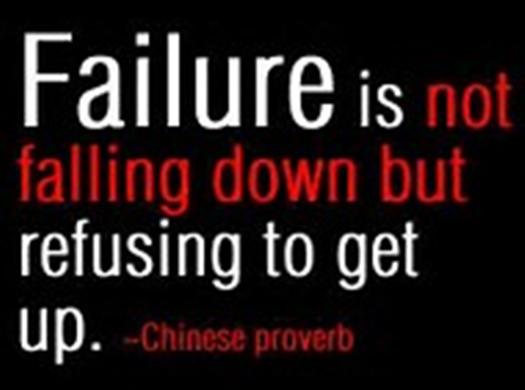 Give me failure every time, especially if I get to redefine it as success.